Headed by our President and CEO, our Management Committee is composed of nine seasoned managers—four women and five men. Discover their profiles. A seasoned manager recognized for his comprehensive strategic vision and transparent approach, Mr. Buron coordinates the full range of mandates, financial programs and tax measures administered by Investissement Québec on behalf of the Government of Québec through the Economic Development Fund (EDF). Paul Buron was appointed Executive Vice-President, Government Mandates and Programs Management in November 2017. Mr. Buron has more than 30 years’ experience in financial management, risk management and business strategies. From 2006 until he joined Investissement Québec, he served as Executive Vice President and Chief Financial Officer of the Business Development Bank of Canada (BDC). Until 2016, he was also in charge of risk management for BDC. In 2011-2012, he held the post of Interim Executive Vice President, Financing and Consulting for one year in addition to his other responsibilities. Before joining the BDC team, Mr. Buron was Senior Vice President and Chief Financial Officer of TVA Group from 2000 to 2006. In that capacity, he was in charge of television operations and regional stations, IT services, investor relations and human resources. Bachelor of Business Administration from HEC Montréal, Mr. Buron started his career at Price Waterhouse Coopers. He has also worked for Société générale de financement du Québec, Pétromont and Donohue, and was a member of the Ordre des comptables professionnels agréés du Québec (CPA) for more than 30 years. An acknowledged builder and team player, Alexandre Sieber has solid experience in such areas as commercial financing, investment and service companies. He is responsible for implementing Investissement Québec’s key strategies and leads all financing and investment activities related to Investissement Québec’s own equity. Alexandre Sieber was named Executive Vice-President, Business Financing and Client Strategies in March 2017. Prior to joining Investissement Québec, Mr. Sieber had served as Senior Vice President and Senior Managing Director at CBRE since 2012. He was responsible for strategic orientation, operational and financial performance of CBRE’s brokerage operations in Québec. He also co-led the company’s Debt and Structured Finance – Capital Markets division for Canada. After graduating from Université de Montréal with a bachelor’s degree in law and from HEC Montréal and University of St. Gallen (Switzerland) with a bachelor’s degree in business, Mr. Sieber began his career with RBC in 1997, as a Senior Account Manager. He held that position for three years. He spent the next 12 years at GE Capital, where he was Managing Director, Global Investment Management in New York City, and Vice President and General Manager of both GE Real Estate and GE Aircraft. As a high-level financier, with a wealth of experience in banking, Mr. Settano applies both discipline and vision in monitoring Investissement Québec’s financial governance and profitability. Christian Settano was appointed Executive Vice-President, Finance in February 2017. With more than 18 years of experience in finance, he had previously served as Vice President Finance – Retail and Commercial Banking at Laurentian Bank of Canada since 2012. In that position, he was responsible for strategic planning for the business line, financial control, and financial budgeting and analysis, among other things; he also acted as chief financial officer of LBC Financial Services. From 2003 to 2012, Mr. Settano held the positions of chief financial officer, division financial manager and controller at the Montréal and New York offices of Société Générale. Mr. Settano holds a bachelor of business administration degree and a graduate diploma in accounting from HEC Montréal and is a member of Québec’s order of CPAs. He started his career at Ernst & Young. Influential leader Marie-Josée Lapierre is known for her sound legal counsel and ability to steer teams toward cohesion and success. She is a key member of Investissement Québec’s senior management team and responsible for all of the Corporation’s legal and regulatory affairs. 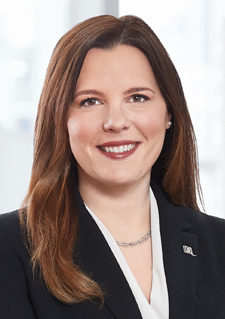 Marie-Josée Lapierre was appointed Vice-President, Legal Affairs and Corporate Secretary in January 2018. As a seasoned lawyer and skilled negotiator, Ms. Lapierre has been involved in numerous strategic transactions with multidisciplinary teams. She brings to Investissement Québec a wide range of capital market experience, particularly in debt and equity financing transactions, commercial law and governance. Prior to joining Investissement Québec, Ms. Lapierre served as Director, Legal Affairs and Assistant Secretary of Yellow Pages Limited, where she led the team responsible for corporate governance and regulatory compliance, mergers and acquisitions, financing transactions and commercial law. She previously worked at the law firm BCF from 1998 to 2002. In 2007, she was named one of Canada’s leading lawyers under 40 by Lexpert Magazine and lawyer of the year (in-house category) by the Montréal Young Bar Association. Holding a bachelor of laws degree from Université de Montréal and an MBA from McGill University, she has over 18 years of experience in commercial law. With his recognized expertise in accounting and financial management, Yves Bourque keeps a close watch on risk management at Investissement Québec. He also directs process reviews within the organization, giving priority to efficient, high-quality customer service. Yves Bourque was appointed Vice-President, Risk Management at Investissement Québec in April 2015. From 2011 to 2015, he was Senior Vice-President, Investment Support and Management, a position he had also held at Société générale de financement du Québec from 2005 until SGF merged with Investissement Québec. A member of the Ordre des comptables agréés du Québec since 1987, Mr. Bourque has 30 years of experience in accounting and financial management. Over the years, he has played a vital role in the start-up and management of high-growth companies. Mr. Bourque launched his career at Samson Bélair/Deloitte & Touche, where he quickly rose to become Director, Certification, a position he held from 1989 to 1994. Subsequently, he was Director, Finance and Administrative Services for Consortium UBI Inc. from 1994 to 1997 and Vice-President, Finance and Secretary General at Connexim, a limited partnership, until 2005. A strong advocate of teamwork and collaboration, Mirabel Paquette is known for her superb organizational skills and business acumen. She is an excellent ambassador dedicated to promoting our service offerings and broadening our reach with our clients and partners. Mirabel Paquette was appointed as Investissement Québec’s Vice-President, Public Affairs and Corporate Communications in 2015. Since September 2017, she has led not only the Public Affairs and Communications teams, but also the team in charge of the Corporation’s strategic information, sustainable development and social responsibility activities. Ms. Paquette has over 18 years of experience in marketing and communications, including over 14 years in the legal field. During her career, she served as Director, Operations and Event Management and Director, Marketing and Communications at Stikeman Elliott. Very active in the business community, Ms. Paquette is on the board of the HEC Montréal Foundation. Since October 2015, she has also sat on the board and the executive committee of the Fédération des chambres de commerce du Québec (FCCQ). She was a member of the board of Société du Palais des congrès de Montréal from 2004 to 2012 and the chair of Réseau HEC Montréal from 2006 to 2007. Ms. Paquette has a bachelor’s degree in management from HEC Montréal. Recognized for her leadership and expertise, Ms. Pinsonnault seeks to spur the growth and competitiveness of businesses and position our organization as a vital player in creating wealth in every region of Québec. She also heads efforts to develop and implement Investissement Québec’s strategies and strategic initiatives. In addition, as the co-leader of “Propulser nos manufacturiers innovants,” Investissement Québec’s Innovative Manufacturing Initiative launched in 2016, she works to energize Québec’s manufacturing industry. Ms. Pinsonnault was appointed Vice-President, Strategic Initiatives and Management Committee Advisory Services in September 2017. She is responsible for all of Investissement Québec’s major strategic projects, including the Innovative Manufacturing Initiative, and counsels the Management Committee. three-year stint as Director, Corporate Initiatives, Policies and Products in the Credit and Risk Management Division. With an MBA in International Business and Export Management from the City University Business School in London, England, Ms. Pinsonnault was named CEO of FIER Partners LP when the $180-million investment fund was created in 2005. From 2002 to 2004, she was Senior Portfolio Manager at Investissement Québec. Previously, from 1996 to 2001, she served as Manager, Structured Finance at CAE Electronics, where she oversaw project financing, investment and risk management, primarily outside Canada. She has also held other executive positions at Scotiabank, Export Development Canada and Raymond Chabot Grant Thornton. Recognized for her ability to build and manage results-oriented teams, Marie Zakaïb is proficient at developing and implementing human resources strategies in changing environments. Marie Zakaïb was named Vice-President, Talent, Culture and Corporate Communications in March 2017. Prior to joining Investissement Québec, she worked for 30 years at TD Bank Group, where she served as Vice-President of Corporate Human Resources and Employee Relations for the Group’s business divisions from 2014 to 2017. Armed with a bachelor’s degree in business administration (finance) from Université du Québec à Montréal, Ms. Zakaïb began her career as a Commercial Accounts Manager with TD Canada Trust in 1987, before she developed an interest in human resources and industrial relations. Starting out as an Advisor, she held the post of Human Resources Director until 2004. She quickly climbed the corporate ranks to become Senior Director of Human Resources at TD Insurance and later Vice-President of Human Resources, Corporate Functions and Labour Relations, from 2006 to 2014. Her responsibilities in that role included transformation and change management projects.